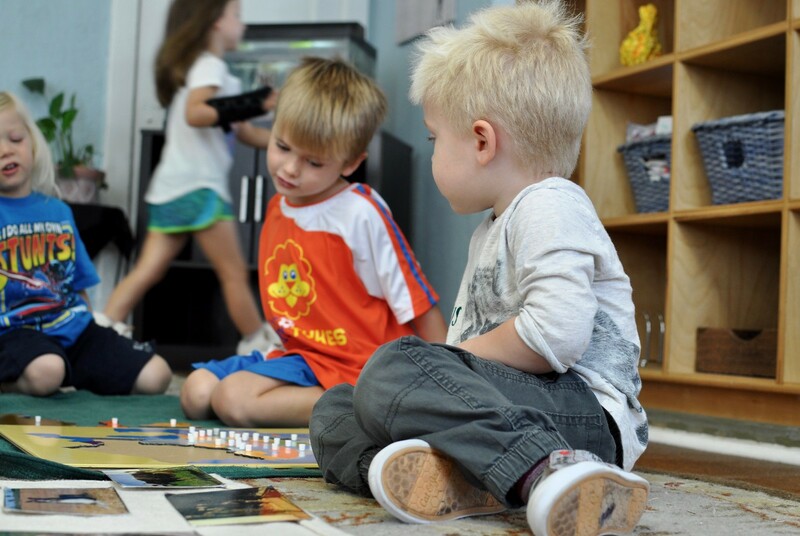 We have observed over the years the delicate balance between siblings placed in the same classroom here at Villa di Maria; more often than not, a younger sibling trails behind her older sister, or an older brother encourages his younger sibling during a moment of frustration. At other times, siblings may completely ignore each other, choosing instead completely different groups of friends and only regrouping when they enter the same car at the end of the day! 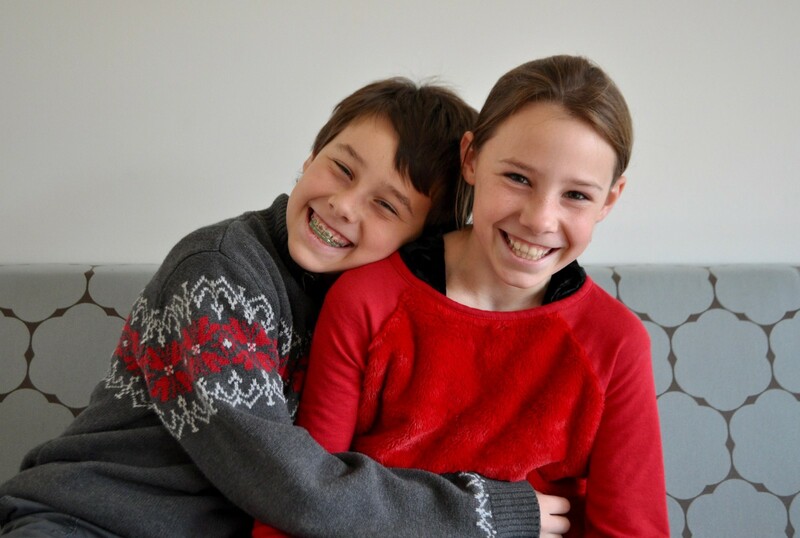 Here, we discuss the benefits of the mixed-age classroom and how it relates to siblings in particular. The benefits of the mixed-age classroom are many: mainly the ability to observe, learn from, and be inspired by older children. But the younger children are not the only ones who benefit from this set-up; older children receive a boost of confidence in being leaders. In short, children learn to help and be helped by other children. Oftentimes, younger siblings are inspired by the work of their older siblings. Above, a younger brother observes his sister working on metal insets and design work, and not only chooses the same work, but also chooses to work in close proximity to his sibling. 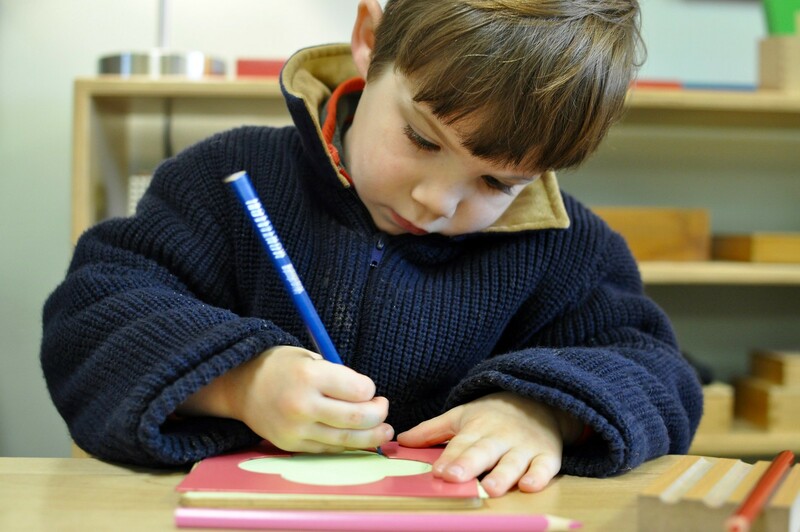 There is a community aspect to every Montessori classroom that is built on mutual respect. 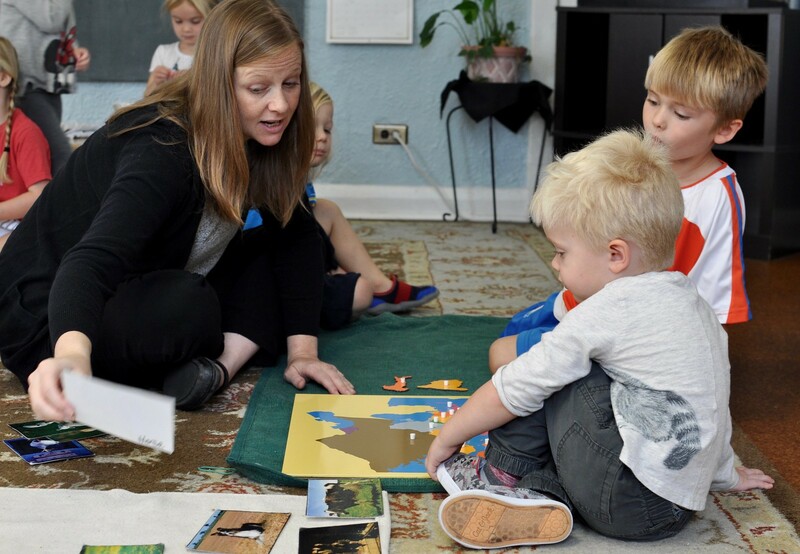 Having children of differing ages within the same community reduces competition, increases empathy and willingness to help, and produces, quite often, a feeling of family within the classroom. Older children feel a sense of pride and accomplishment (in addition to reinforcing previously learned concepts, leading to further mastery) each time they help a younger child. In addition to the mixed ages, the fact that somewhere around two thirds of a class returns each year reinforces the feeling of community and stability. “I love having siblings in succession in the room, sometimes in the same classroom and sometimes apart. The eldest child paves the way and the younger often looks forward to a lesson that their sibling had. ‘I can’t wait to go to MMUN’ is a common one. It makes the whole process less daunting when they watch their older brother or sister partake. 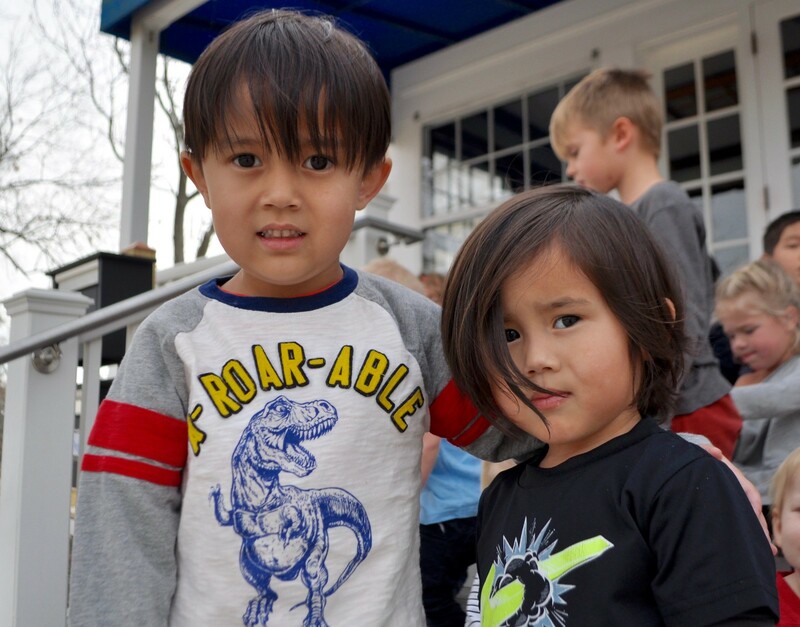 For siblings who are not in the same class, recess is often a time for them to reunite! 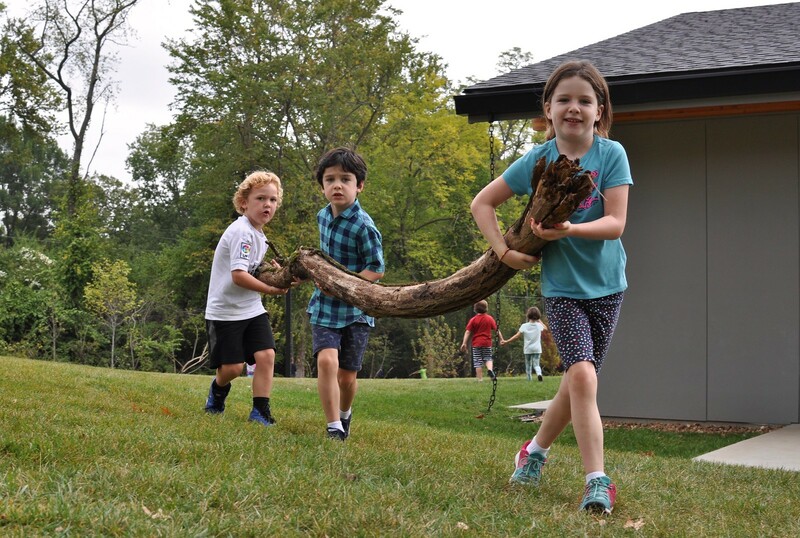 Above, a sister and brother and their friend work together to move a large branch for their fort-building. 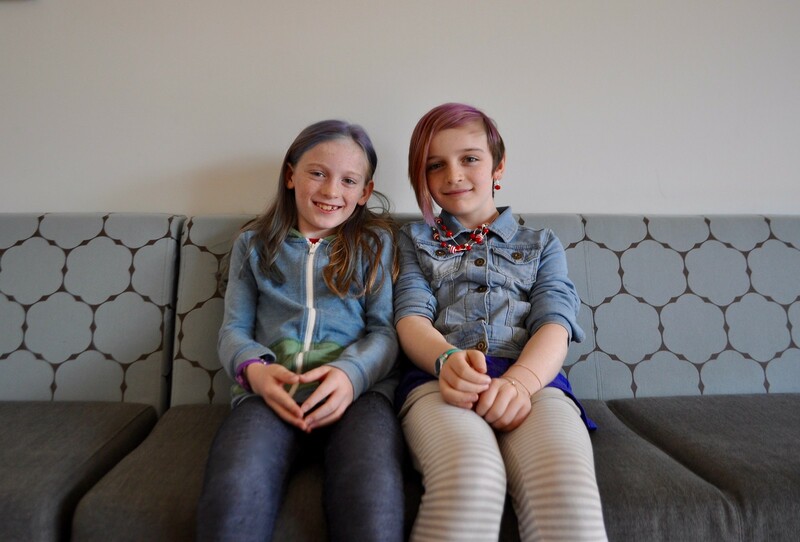 “I’ve often been surprised by how infrequently some siblings interact in the classroom and at recess when they are given other choices of people to be with. The environment goes a long way toward setting up successful ways for them to act and be independent from one another. While sometimes the natural draw to one’s older sibling is beneficial, at other times it can prove distracting. At times, an older sibling may feel responsible for his younger sibling and focus on his wellbeing rather than focusing on his own work. At other times, the younger sibling may be distracted from his work to see what his older sibling is doing (see above). Rest assured; neither situation is particularly significant, and often the Guide can easily shift either sibling’s attention back to his original work within moments of the distraction. The above scenario lasted only a few seconds; the Guide gently redirected the little brother, who continued his own individual work right next to his brother. 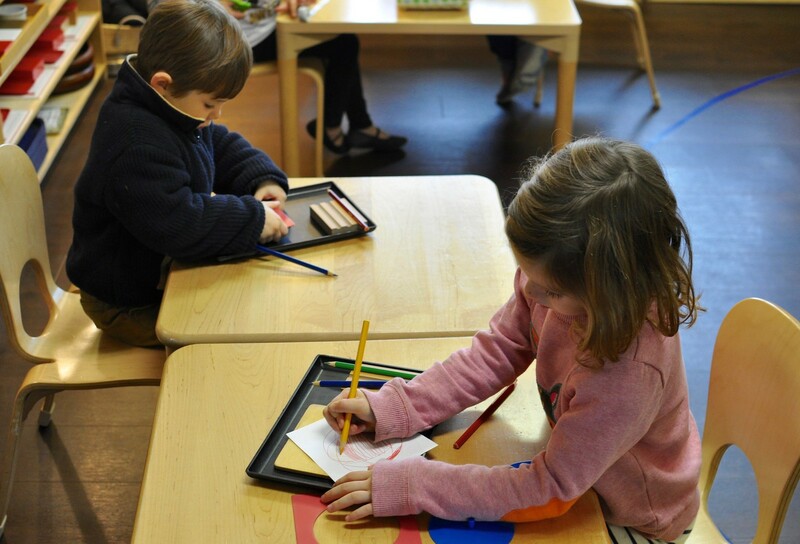 It is also worth noting that this is a natural part of the mixed-age classroom and has less to do with siblings sharing the same space than it does with having varying ages within the classroom; the littles will always be paying attention to what the “big kids” are doing, and will in turn be inspired to do that work once their time comes. If distracted and disruptive behavior is part of a broader pattern, the Guide can implement a plan with the parents and the classroom Aide, as well as being conscious of the dynamic between the siblings, working with them to promote more functional behavior for all involved. Sometimes Guides (alongside parents) decide to separate siblings. This may be a simple request from the parents before the beginning of the school year based on what the parents have observed at home (I spoke to one parent who assured me that his children needed a break from each other during the school day – and there’s nothing wrong with that! ), or it may simply be based on the parents wishing for the siblings to establish their own space and boundaries (which is often seen with twins, but not always). There are also circumstances under which a complicated home dynamic may prove to carry over into the classroom environment and become difficult to manage. In this case, the Guide and parents may choose to separate the siblings. However, this is not a common occurrence. 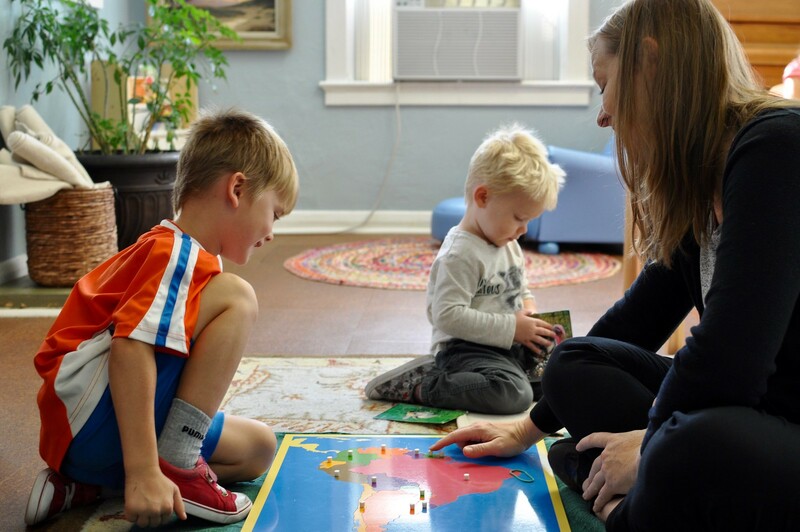 Overall, the Montessori environment provides wonderful opportunities for siblings to work and learn alongside one another. We are so grateful to be the observers of this sweet and special dynamic!